While the Fresh Locations library is impressively vast, we still hand-pick all of our locations, to ensure that each one brings something special to the mix. In the case of ‘Sheen Modern’, it’s hard to quantify the number of USPs. How often do you get a vast Modernist-inspired house full of beautifully proportioned, stunning rooms on a par with the finest homes in LA? How often to you get three acres of mature and manicured grounds, giving onto parkland and complete with kitchen garden, orchard, fields, stables and yurt? All in London. And did we mention the sleek swimming pool, which can be both between indoor and outdoor, to suit your mood. They kept the material palette deliberately simple, ‘we call it the Kyoto treatment, with a stone ramparts on the lower floor and an elegant wooden box above.’ Although this description belies the man-hours involved. 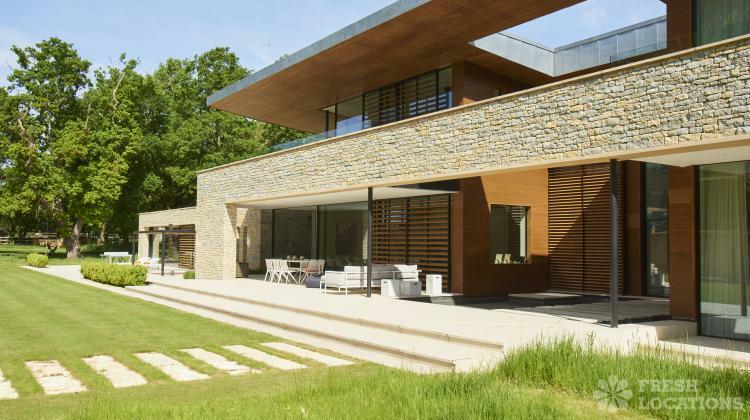 The stone, all from a quarry in Lancashire, was hand-knapped on site by five specially trained workmen ‘tick-tick-ticking away for nine months’ to create a contemporary nod to the ancient British craft of dry-stone walling. Meanwhile the timber has been epoxy-infused to ensure that it will continue to look as beautiful as it does now. Similar trouble was taken with the inside of the house where the vast kitchen’s central statement is a seven-metre long monolithic countertop in sleek stainless steel – which proved a logistical challenge, ‘in the end we managed it but it took fourteen people to get it in place.’ The furniture mixes timeless Ligne Roset sofas, decadent Murano chandeliers and a personal touch with the dining table, fashioned from a tree that fell down in the garden. While the quality of south-facing light and up-scaled rooms go to make this a wonderful location for filming and stills photography (‘crews tell us they love it because they can use a long lens’), the house works brilliantly as a location because everything has been so well thought out, ‘it’s more like several locations in one’ says Simon. There are plenty of bedrooms, and a separate self-contained staff flat that can be used for hair and make-up, wardrobe or as a green room. They have also future-proofed the electrics, creating a three-phase power board, available by arrangement, allowing major shoots to just wire in their commando socket and get going, without the need for a generator. There are many distinctive living spaces including an outdoor living area and incredible media room that works brilliantly as a cinema or night-club – complete with bar and disco lights. There’s that beautiful pool – complete with sauna and gym – and so many great features in the grounds, such as the yurt brought back from Ulaanbaatar and decorated in glamorous Moroccan fashion. The timber overhang around the house keeps it cool in summer but lets in the low winter sun and provides shelter for outside shooting on bad-weather days. Then there’s off-road parking for 22 vehicles (with more space offsite for catering trucks etc, by arrangement). They have great relationships with the neighbours who are at a sufficient distance that late working and night shoots are not a problem. Even the garage causes a stir, ‘car shoots tell us it’s the kind of polished space they normally have to travel to the US or Germany for’ says Simon. Feedback for the location has been great, ‘one tech giant came here to get two shots but there was so much scope that they ended up doing seven. Fresh Locations have guided us very well and all our clients have all treated the place with respect – we’ve had a really good time with all our shoots.’ It’s good to know that our clients are as happy with us as we are to have them registered with Fresh Locations.